As the year comes to a close, it provides an excellent opportunity to look back at the successes we have all shared and how we achieved them. 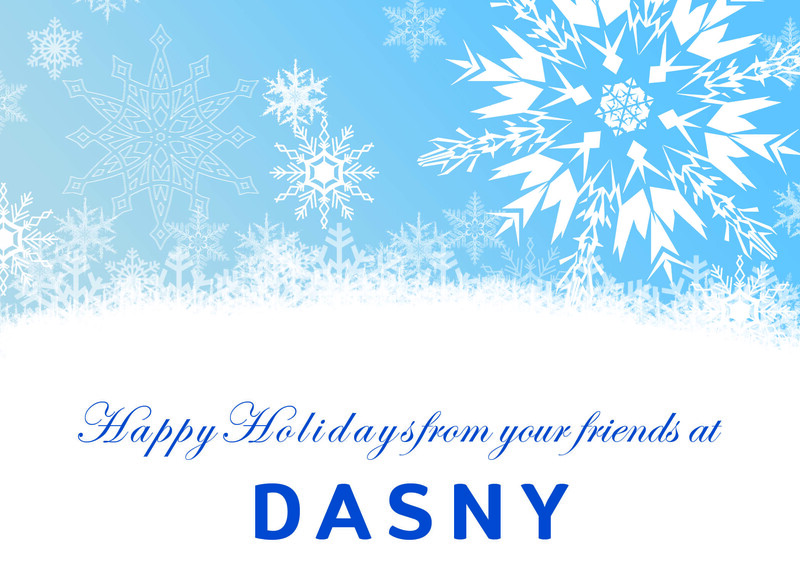 DASNY is incredibly fortunate to have clients and partners who all work toward the same goal of making New York State a better place to live, work and learn. Thank you to each and every one of you for your support throughout the year and I look forward to expanding our relationships and reaching ever higher in the year to come. By any measure, 2016 was a banner year for DASNY. Our success was built on initiatives developed by DASNY in partnership with New York’s premier health and education institutions, and our partners in finance and construction, to improve outcomes, control costs and deepen our service offerings. The year opened with DASNY entering into the market with recast financing guidelines, policies, processes and service options that increase a clients' ability to fund their capital investments with speed, certainty and flexibility. This included partnering with the Department of Health to cut red tape and speed access to bond proceeds, and the development of a hybrid financing product that combines taxable and tax-exempt bonds to give clients greater flexibility. In 2016, we added Construction Manager Build to our alternative project delivery tool box, and intensified our focus on applying Construction Manager at Risk and Design-Build. These alternatives give our clients the widest possible range of project management tools, helping them to manage risk and find efficiencies. Upgrading our information systems to give staff best-in-class technology. Merging our MWBE and procurement teams to improve our contracting process. Implementing a program to ensure knowledge is transferred and developed so that DASNY staff has the skills and experience our clients need. DASNY issued a record-breaking $8.3 billion in bonds during Fiscal 2016, including Board approval of more than $3 billion in financings in one day, funding public and private institutions across the state. In June, New York University completed the largest private client offering in DASNY’s 72-year history at more than $800 million. DASNY is delivering on the broadest array of construction projects in its history with almost 1,000 ranging from dormitories to research centers to parks and resiliency efforts. As we head into 2017, we will build on these successes and expand our capacity to do more. Already underway is an effort to develop a long-term strategic plan that will serve as a road map for enhancing DASNY’s service delivery systems. The strong foundation we have developed over the last year has DASNY entering 2017 as an innovative, knowledgeable and reliable economic engine for New York State. We take pride in our role as a leader and will continue to set the bar high for achievement. We look forward to working hand-in-hand with you as we reach higher than ever before. Thank you for your continued partnership as together we finance and build the health and education institutions that form the backbone of inclusive, sustainable communities and help them compete on the global stage. I wish each and every one of you a wonderful holiday season and a happy, healthy and prosperous new year. DASNY is helping to finance and build a rising research corridor in the heart of New York City. In April, DASNY helped finance Columbia University’s Manhattanville campus. 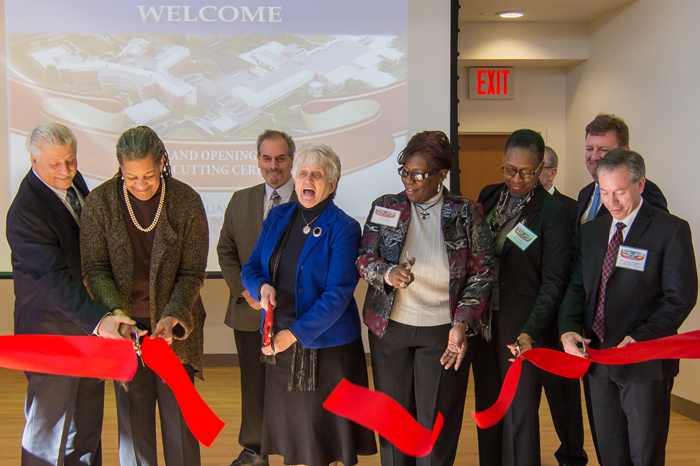 This included $50 million in Green Bonds to support the construction of the University’s Jerome L. Greene Science Center. 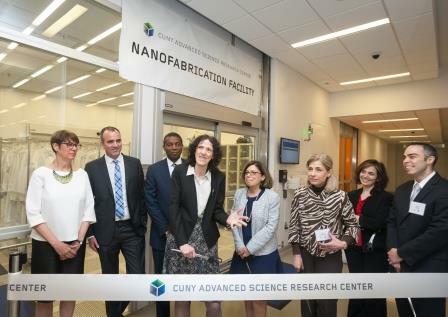 In May, DASNY President and CEO Gerrard P. Bushell helped cut the ribbon on the highest value project in DASNY’s history, with the opening of CUNY’s approximately $700 million Advanced Science Research Center. In June, NYU completed the largest private client offering in DASNY’s 72-year-history at more than $800 million. A $200 million portion of the financing will be used to construct the NYU Langone Medical Center Science Building. DASNY President and CEO Gerrard P. Bushell has instituted improvements at DASNY to make it everyone’s responsibility to ensure that minority-owned, women-owned and service-disabled veteran-owned businesses participate in every contract. The creation of the Resource Acquisition Unit combined the focus of MWBE involvement from DASNY’s Opportunity Programs Group with the partnership-development know-how of DASNY’s Procurement Unit. The move improves DASNY’s contracting process and ensures MWBE is a focus of every contract from start to finish. 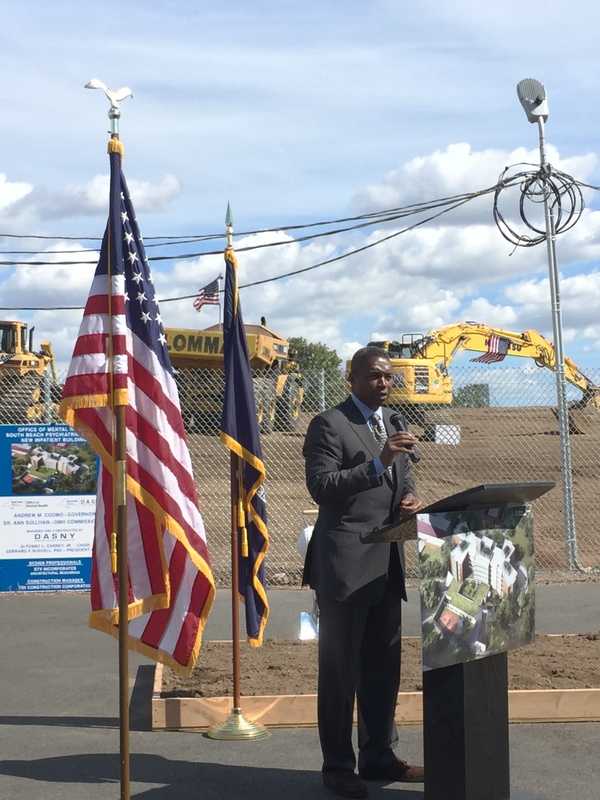 DASNY surpassed Governor Andrew M. Cuomo’s 30 percent MWBE contracting goal with the New York State Office of Mental Health’s $350 million Bronx Behavioral Health Campus, which opened in January. The Resource Acquisition unit is working to deliver this success to every project. 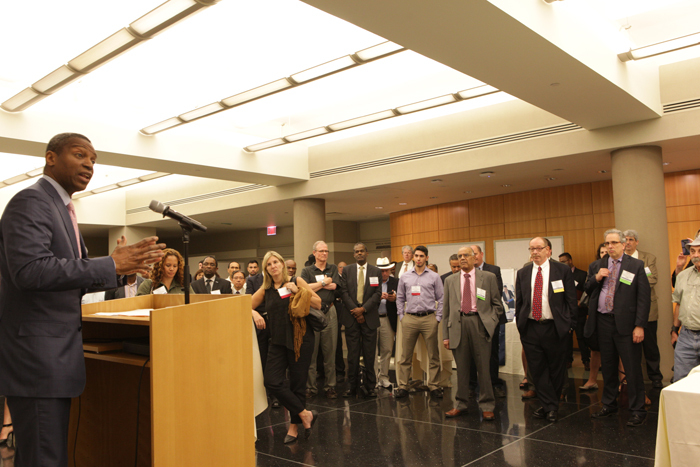 DASNY also sponsored two MWBE networking conferences. The events drew hundreds of attendees, who were informed that in order to do business with DASNY, they need to work with MWBE firms. Starting in January 2017, DASNY will begin a surety bond training program to help MWBEs obtain and build the bonding capacity they need to compete on equal footing for New York State and private sector contracts. DASNY is building sustainable, resilient infrastructure across New York State that will reduce New York’s impact on the climate while preparing communities for powerful storms. 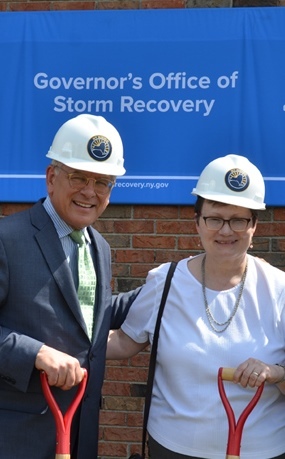 This work includes 88 projects with the Governor’s Office of Storm Recovery (GOSR). 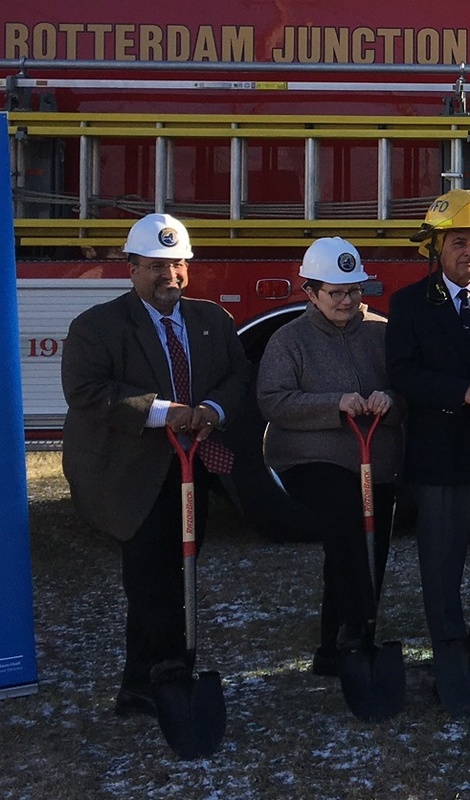 In July, ground was broken for the installation of five emergency standby generators in Amsterdam, one of many communities hard-hit by flooding and storms in recent years. DASNY is providing design and construction services for the project. In September, ground was broken for the new, inpatient $250 million building at the South Beach Psychiatric Center on Staten Island. The original campus was hammered by flooding from Superstorm Sandy. The new facility is being built on higher ground with sustainable features.